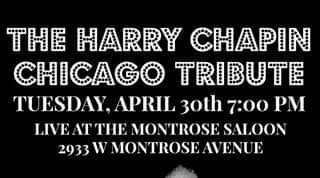 HARRY CHAPIN TRIBUTE NIGHT Hosted by Greg Jackson Combs Tuesday, April 30; 7-11 pm $5 - FIVE DOLLARS CASH MONEY COVER CHARGE - $5 https://en.wikipedia.org/wiki/Harry_Chapin Harry Forster Chapin (December 7, 1942 – July 16, 1981) was an American singer-songwriter, humanitarian, and producer best known for his folk rock and pop rock songs, who achieved worldwide success in the 1970s and became one of the most popular artists and highest paid performers. Chapin is also one of the best charting musical artists in the United States. Chapin, a Grammy Award winning artist and Grammy Hall of Fame inductee, has sold over 16 million records worldwide and has been described as one of the most beloved performers in music history. Chapin recorded a total of 11 albums from 1972 until his death in 1981. All 14 singles that he released became hit singles on at least one national music chart. As a dedicated humanitarian, Chapin fought to end world hunger; he was a key participant in the creation of the Presidential Commission on World Hunger in 1977. Chapin is credited with being the most politically and socially active American performer of the 1970s. In 1987, Chapin was posthumously awarded the Congressional Gold Medal for his humanitarian work.